The Psalms call it selah-the pause, rest, or interlude between the notes in a song. More than merely an empty space, selah is a chance to stop and resync with the story and song of God. For all the ways life keeps you running, this word and practice offers a way to re-center yourself on the One who holds all things together and makes all things beautiful. Stretched beyond her capacity in caring for a large family in the middle of Manhattan, Kristen Kill was exhausted, depressed, and desperate for a change. Then something sparked within her when she read the Psalms, and found that often all that stood between the psalmist's cries for help and celebrations of praise was this simple word, selah. 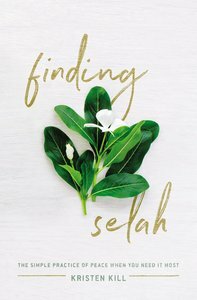 Join Kristen in Finding Selah for a journey that will transform the way you think about work, rest, and the little spaces in between that make all the difference. This book will show you how to tune your ear to the song God is singing over you, embrace the "selah moments" able to transform your daily rhythms, and most of all, encounter the ultimate Selah in Christ, who stands in the gap between heaven and your most hectic of days. There is hope for the dissonance you feel. Finding Selah will show you not only how to sing a new song, but to live a new way.